Sausage Stuffed Tomato Recipe: Imagine tomatoes as big as saucers stuffed with a savory sausage mixture just the way Grandma prepared them! The key to success with this simple sausage stuffed tomatoes recipe is to start by selecting large vine ripened tomatoes. Tomatoes should smell like you just picked off the vine in your own “potager” or vegetable garden. Half the flavor power of this easy recipe is the taste of the freshest sun ripened tomato! For this recipe, I did not have the option to pick the tomatoes in a vegetable garden. Size wise, when selecting them in the produce section of your neighborhood supermarket, aim for tomatoes that are 3 to 3 1/2 inches across. 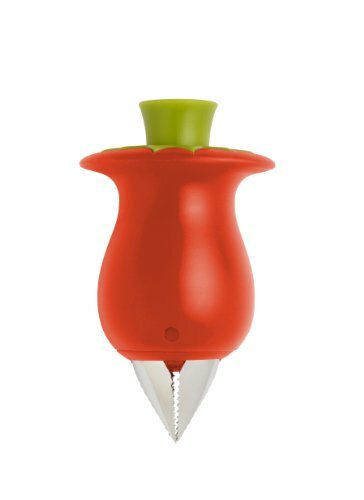 When slicing tomatoes for a salad, a tomato sandwich or other veggies, use a quality serrated utility knife to make the task effortless! A tomato that size makes a single healthy meal portion along with side dishes. When spooning out the flesh, take care not to break the outer skin. 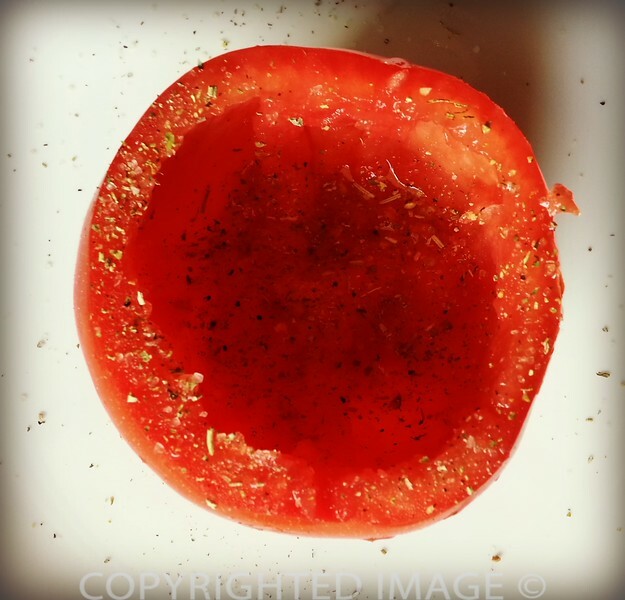 I aim for an even 1/4 inch of flesh, so the tomato cooks evenly yet maintain its shape. First, scoop out all the tomatoes you plan to stuff. 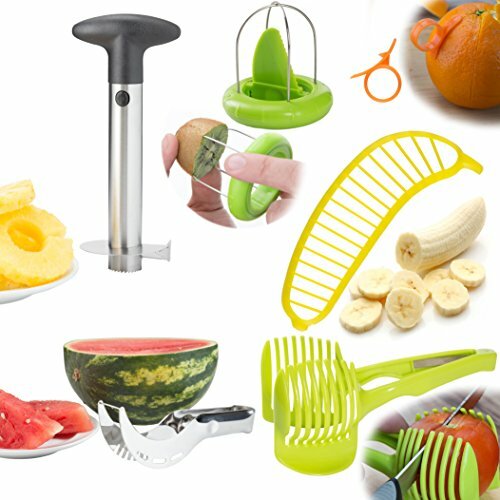 Set the pulp aside. Dice it into small, even pieces. Save the tomato juice as well. Cook the sausage meat over low heat until cooked through but not dried. You can drain it on a paper towel if you like. My grandmother made her sausage mix from a combination of lean and fatty pork seasoned with shallots, garlic, parsley, coarse salt and freshly cracked pepper. Every so often, the butcher prepared well seasoned “chair à saucisse” that she used to stuff potatoes as well as prepare her famous stuffed tomatoes. It was just as tasty! I use sausage meat seasoned with sage (I call it my Bob Evans© sausage stuffing ) but if you like things spicy, you can replace it with a spicy sausage mix. In this case, I would not add any garlic – unless of course you want that extra kick. 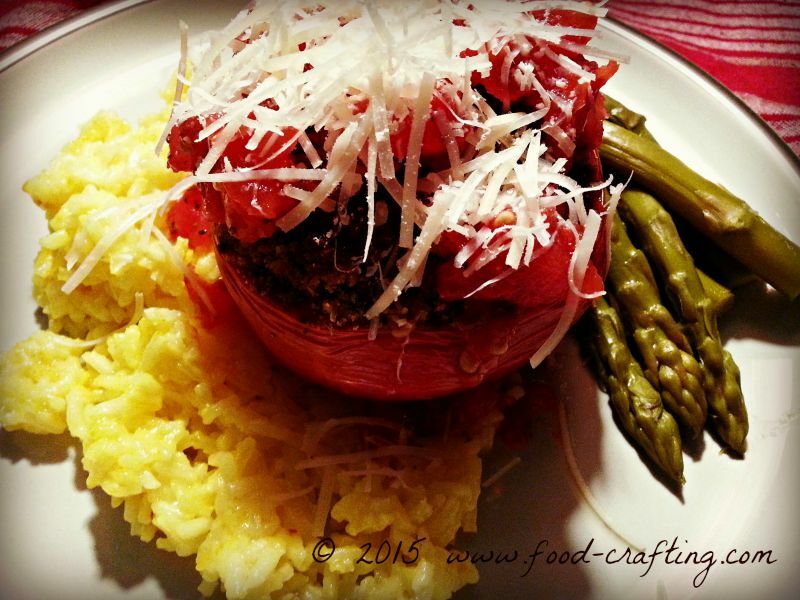 Prefer Italian Sausage Stuffed Tomatoes? That’s an easy fix. Use a loose Italian sausage mix (spicy or sweet) and season to taste. Make it fresh garlic (as much as you want) and fresh parsley. Add to the sausage meat and stir well to combine evenly. Add the crumbled bread to the sausage mixture. Try not to nibble on the sausage stuffing as you prepare it. I say this because I was hungry while making dinner. The result? Only enough sausage stuffing for three of my four tomatoes! If the sausage stuffing still seems greasy to you, spoon onto a paper towel again just long enough to absorb any fat. A small Pyrex© pie plate is the perfect baking dish for this recipe. 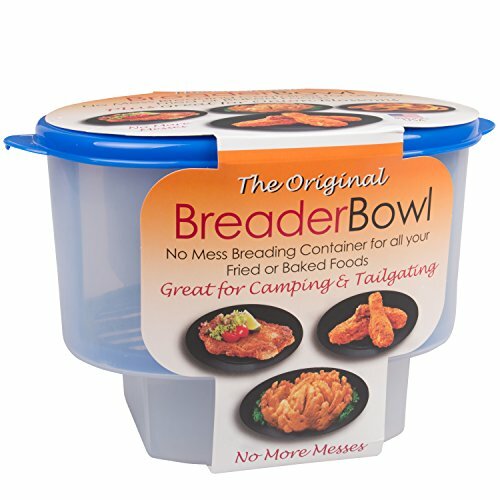 Makes individual servings easy to prepare and serve. All you need to do is set the mini pie plate directly on the dinner plate. Season the tomatoes and fill with the sausage mix. Top with breadcrumbs. 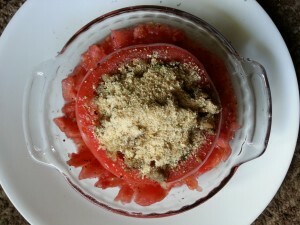 Surround the filled tomatoes with the tomato pulp. Season to taste. Bake in a 350-degree oven for about 45 minutes. Spoon some of the tomato mix over the tomatoes to keep them moist. Use a cake tester to determine if the tomatoes are cooked through. 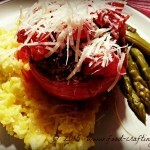 The stuffed tomatoes should be soft but maintain their shape and not collapse when serving. 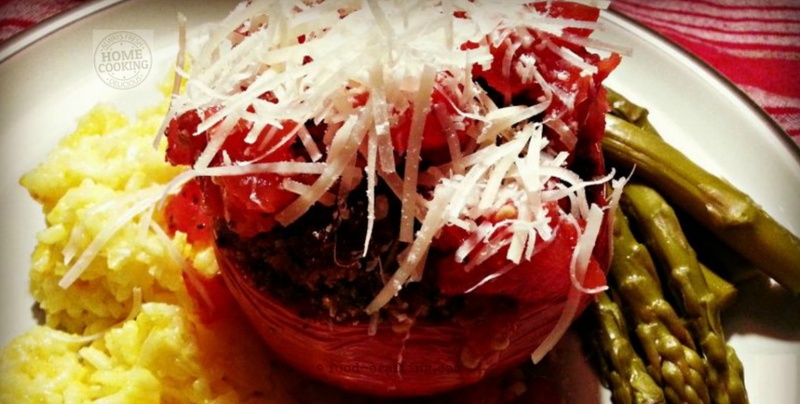 Nothing tastes like “home” more than Grandmère’s Sausage Stuffed Tomato recipe. 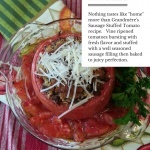 Vine ripened tomatoes bursting with fresh flavor and stuffed with a well seasoned sausage filling then baked to juicy perfection. Season the inside of the tomatoes with herbs, salt and pepper. Set aside. Cook the sausage over low heat so that the fat is rendered but the sausage meat is not dried out. 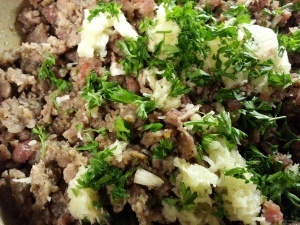 In a clean pan, add the drained sausage, the garlic, parsley, crumbled bread dough and added seasonings – to taste. Mix to combine well and keep on low heat while you prepare the baking dish. Butter a deep pie pan or oval baking dish (large enough to fit your tomatoes without crowding them). Fill the tomatoes with the sausage stuffing. Place in your baking dish and surround with reserved tomato pulp. Lightly season the tomato pulp. Bake in a preheated oven basting as needed for 45 minutes to 1 hour depending on the size of the tomatoes. Why not use ground turkey or lean ground beef? Less fat but not seasoned so make sure to adjust the seasonings of your meat mixture as you prepare the tomato “stuffing”. 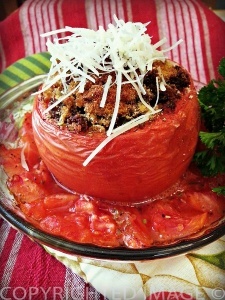 We hope you will prepare Grandma’s “#recette” for stuffed tomatoes with sausage. The recipe is as home style tasty as you might imagine! Click HERE are more French Country Cuisine recipes. 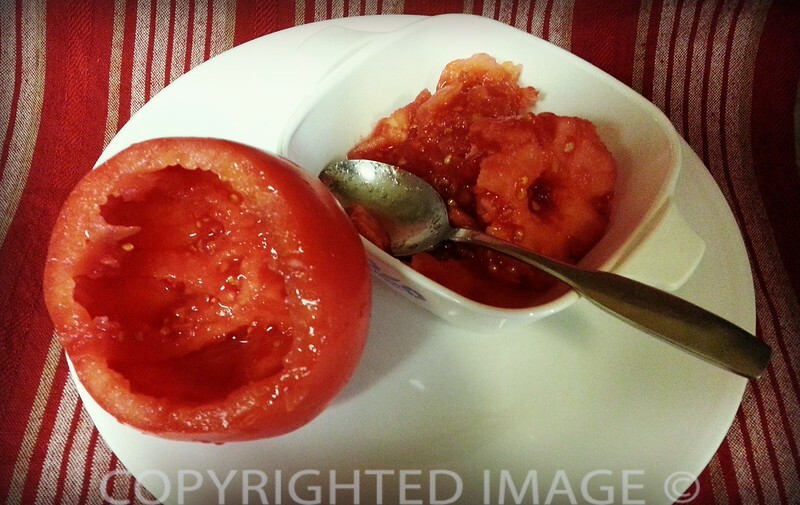 Enjoy Grandmère’s simple but yummy sausage stuffed tomato recipe. 2 Prefer Italian Sausage Stuffed Tomatoes?